mākimāki Furniture Works' Cameron Hird, and contemporary artist Tanya Pink nominated Bravehearts, a charity dedicated to making Australia the safest place in the world to raise a child. Cameron was drawn to Tanya’s art because of it’s subtlety - emotive, raw, but delicate. Their challenge was to integrate the two crafts as harmoniously as possible. 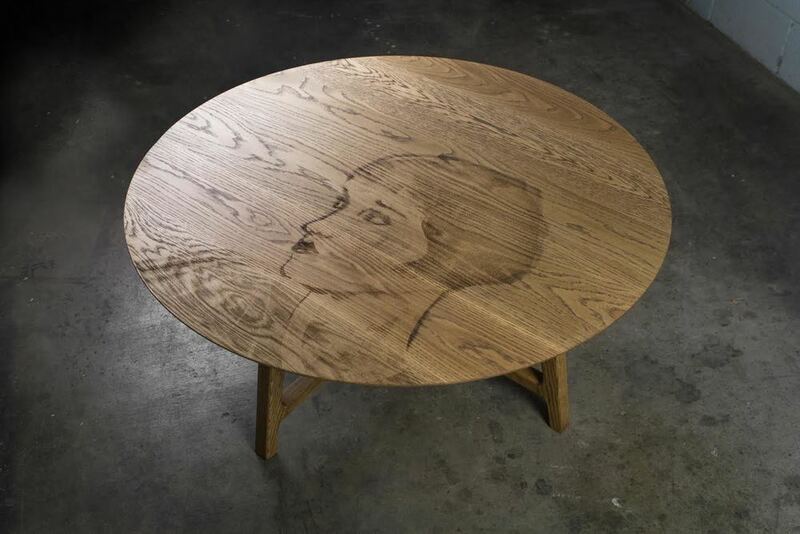 By laser etching the image of Tanya’s painting, 'Louise In Green’ into the timber top, they were able to preserve the subtlety of Tanya's art and meld Cameron's craftsmanship fluidly together to create a striking but carefully restrained piece. Cameron's aim is to create furniture that’s both distinctive and functional, custom made using the finest materials and crafted to an uncompromising standard. He works with a variety of materials, often mixed, but timber always has a starring role. It's tactile and a totally unique material that plays on the senses - sight, touch and smell. For this reason, it’s a common feature in his designs. View Cameron's Handkrafted Profile here. Tanya Pink lives in Brisbane and is an emerging artist, with acrylics being her paint of choice. Tanya likes to use a limited palette in a basic but vital way and likes to focus on creating devotional art (especially human faces and emotions). Tanya, being inspired by classical art studies, paints an emerging idea not a whole. She attempts to depict innocence and fragility, an elusive and difficult quality to capture on canvas. It makes sense that she has always been fascinated by classical art and sculpture, and it is this, and renaissance art that motivate her. Bravehearts' vision is to make Australia the safest place in the world to raise a child by 2020. To achieve this they depend on business, government and community support. This will ensure continued delivery of their school-based prevention programs as well as training, counselling, support and advocacy for survivors. It will also allow continued research and important legislative reform agenda. View the Bravehearts website here.